One of the most quoted texts from the collection discovered at Nag Hammadi, “Thunder, Perfect Mind” is perhaps the least understood one. The author presents a scripture founded upon a deep knowledge of the two trees from the Garden of Eden: the Tree of Life, which is the science of Kabbalah, and the Tree of Knowledge, which is Daath or Gnosis, the science of Alchemy. Those who have studied this document without such sciences at hand have been left confused. But when illuminated with the wisdom of these two fundamental sciences, this text is revealed as a truly precious and vital teaching. “Thunder, Perfect Mind” contradicts much of the modern, established religious theories and beliefs of Christianity and Judaism. This document emphasizes a divine power that is not only feminine, but it (she) contradicts a whole host of theological dogmas. The view of this text is completely Gnostic: divinity cannot be reduced to belief or theory, it must be experienced to be understood. Those who remain trapped merely within the intellectual (theories, ideas) or sentimental (beliefs) are excluded from the experience of truth. The great value of this document resides in the emphasis it places on this fact: so long as we continue bottled up with dualistic notions (belief and disbelief, theory A vs. theory B) we remain in darkness. No person of understanding should ever accept anything in a dogmatic way. It is urgent to first Investigate, Understand, and Inquire, before accepting. Accepting or rejecting any doctrine or concept reveals a lack of mental maturity. When we reject or accept something, it is because we have not understood it.Whenever understanding exists, accepting or rejecting is unnecessary. The mind that believes, the mind that does not believe and the mind that doubts is an ignorant mind. The path of wisdom does not lie in believing, not believing or doubting.The path of wisdom consists in inquiring, analyzing, meditating, experimenting. The paradoxes presented in “Thunder, Perfect Mind” point directly to the mechanical dualism we are trapped within so long as the consciousness remains asleep. Dogmas, ideas and theories do not provide a fundamental basis for real change: only experience does. Real understanding can only be acquired when we experience the truth of what is beyond the physical senses, and that experience comes when we awaken the consciousness. The complete understanding of this document is therefore a matter of conscious experience. To reach such an experience is possible for any person, provided they learn the exact sciences of the two Trees: Kabbalah and Alchemy. Inherent in both of these sciences is the necessity of working with our own consciousness in a direct and active manner, from moment to moment. After all, these Trees share the same roots: the divinity that waits within each one of us. The awakening of the consciousness is synonymous with the opening of the Inner Mind. This is the child-like mind of the great Initiate, the mind that is free of the cage of reasoning and the battle of the opposites. The Inner Mind is the intuitive mind, and is directly connected with our own Innermost divinity. This mind is symbolized by Homer in his great classic of esoteric wisdom The Iliad, as Helen, the beautiful woman. Notes: This translation Thunder Perfect Mind. Translation from James M. Robinson, ed., The Nag Hammadi Library, revised edition. HarperCollins, San Francisco, 1990. Comments in parantheses are by a modern Gnostic instructor. I was sent forth from the (Christic) power (the Solar Logos), and I have come to those who reflect upon me (in meditation), and I have been found among those who seek after me (within themselves through rigorous self-analysis and psychological work, for I cannot abide where there is imperfection). Look upon me, you who reflect upon me (in meditation), and you hearers (“who have the Vishuddha ear”, that is those who have understanding of the esoteric teachings), hear me. You who are waiting for me, take me to yourselves (through transmutation; do not waste your sexual energies foolishly). And do not banish me from your (inner) sight (see me within all things, in all moments; that is, Remember Your True Self). And do not make your voice (verb) hate me (through wrong speech), nor your hearing (of useless conversation or impure language). Do not be ignorant of me (do not sleep; awaken your consciousness, and seek to know me through knowing yourself: that is Gnosis). For (as Christic Substance) I am the first (in Daath, Tantric Knowledge) and the last (in Yesod). I am the honored one (of the chaste ones) and the scorned one (of the fornicators). I am the whore and the holy one (of the Arcanum Six, because I tempt the fools and guide the wise ones). I am the wife and the virgin (because I am your companion on the Path). I am <the mother> and the daughter (of the Initiate, because I give birth to him, and he gives birth to me). I am the members of my mother (I am She who is the womb of everything, and I am born of Her). I am the barren one (the Black Madonna, the unfecundated Divine Mother, who sleeps in those who have not awakened the sacred fire) and many are her sons (egos). I am she whose wedding (power in Yesod) is great, and (am dormant because) I have not taken a husband. I am the midwife (of the Son of Man) and she who does not bear (but the Son of God). I am the solace of my labor pains (because I clean the impurities of my labors). I am (within) the bride and the bridegroom, and it is my husband (Binah, the Holy Spirit) who begot me (with the Word I-A-O). I am (Binah) the mother of my father (Chokmah) and the sister of my husband (Shiva, Binah, the Holy Spirit) and he is my offspring (for Binah is God, the Monad that is born within every Self-realized Initiate). I am the slave of him who prepared me (with a spear to the battle of the enemies of God). I am the ruler of my offspring (because the power of my children comes from me). But he (the chaste one) is the one who begot me (in the forge of the Cyclops) before the time on a (second) birthday. And he (Chokmah as the Son of Man) is my offspring in (due) time, and my power is from him (through Binah that fuels me with his pure sexual energy, sexual purity). I am the staff (spinal column) of his (sexual) power in his (Initiatic) youth (the first Initiations of Major Mysteries), and he is the rod (of kings) of my old age (for I am ancient and eternal, and give power to become a king or Malachim). And whatever he (my son, the Initiate) wills (through Tiphereth) happens to me (for as he achieves initiatic glory, so am I glorified; and as he fails and descends into disgrace, so am I disgraced). I am the silence that is incomprehensible (the Emptiness, the Void) and the idea whose remembrance is frequent (because I enliven all phenomena). I am the voice (verb) whose sound is manifold (because I am the uterus of Daath) and the word (verb) whose appearance is multiple (because the Logos, the verb, is Tri-une: the Solar Logos of Kether, Chokmah and Binah is born through me). I am the utterance of my name (pronounced in Daath). Why, you (fornicators) who hate me, do you love me (the feminine force, through fornication and lust), and hate those (Initiates) who love me (with chastity)? You who deny me (as lust) confess me (as chastity), and you who confess me (as chastity), deny me (as lust). You who (through the Being) tell the truth about me, lie (through your egos) about me, and you who have lied (through your egos) about me, tell the truth (through your Being) about me. You who know me (in Daath, the sexual mysteries), be ignorant of me, and those who have not known me, let them know me (through Daath). For I am knowledge (Daath) and ignorance (fornication, for I am also the Divine Mother Death). I am shame (of your crimes) and boldness (to redeem them). I am shameless (in my honor); I am ashamed (of my child’s foolishness). I am strength (of Athena) and I am fear (Pehar, the fear of God). I am war (against the ego) and peace (of serenity, Samadhi). Give heed to me (who am in all things). I am the one who is disgraced (by the crimes of my child) and the great one (who is eternally perfect). Give heed to my (spiritual) poverty (when my child is fallen) and my wealth (of wisdom and love). Do not be arrogant to me (with your filthy pride) when I am cast out upon the earth (when my child is fallen into disgrace, with the ego alive), and you will find me in those that are to come (back to perfection). And do not look upon me on the dung-heap (of my child’s karma) nor go and leave me cast out (in the prison of Malkuth, the physical world, where my child wanders in suffering), and you will find me in the kingdoms (of Malkuth, in all living things). And do not look upon me when I am cast out among those who are disgraced (because of their crimes) and in the least places (of the Tree of Life, that is the Klipoth), nor laugh at me (because though my child is foolish, I am his Divine Mother, and love him always). And do not cast me out among those who are slain in violence. But I, I am compassionate (towards the consciousness) and I am cruel (towards the ego). Do not hate my obedience (to the Law, the Christ) and do not love my self-control. In my weakness (due to the karmic debts of my child), do not forsake me (by walking away from the Path), and do not be afraid of my power (which is in your sexual force). For why do you despise my fear (of God, Pehar) and curse my pride (or rather, honor)? But I am she who exists in all fears (of God) and strength in trembling (before divinity). I am she who is weak (humble), and I am well in a pleasant place (my heavenly gardens). I am senseless (beyond all senses) and I am wise (Minerva, the Goddess of Wisdom; Chokmah). Why have you hated me in your counsels (with your filthy ego)? Why then have you hated me, you Greeks (intellectuals who abandoned the path of the heart)? Because I am a barbarian among the barbarians? (Barbarian = fallen Aryans; I am among my children, even though they are fallen) for I am the wisdom of the (illuminated intellectuals or) Greeks and the knowledge (Daath) of the barbarians (who seek initiation). I am the judgment (Geburah, the Divine Soul) of the (ones with pure reasoning, the) Greeks (the Initiates) and of the barbarians (those who seek initiation). 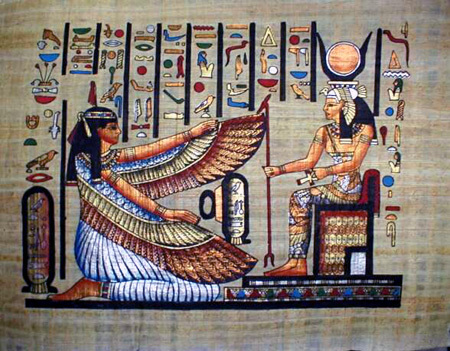 I am (Isis) the one whose image is great in Egypt (the ancient holder of my wisdom) and the one who has no image among the barbarians (because they do not yet know me). I am the one who has been hated everywhere (because humanity loves fornication and pride rather than me) and who has been loved everywhere (in my infernal aspect, as Kali, Nahemah, Lilith). I am the one whom they call Life (Hera, Shakti), and you have called Death (Kali, Coatlique, Proserpine). I am the one whom they call Law (the goddess of Justice), and you have called Lawlessness (in my infernal aspect). I am the one whom you have pursued (in your vain chase after pleasure, in my infernal domains), and I am the one whom you have seized (when you gather me in your transmutation). I am the one whom you have scattered (through fornicating and dispersing your karmic seeds everywhere), and you have gathered me together (by seeking initiation through transmutation). I am the one before whom you have been ashamed (when your crimes are presented before me), and you have been shameless to me (because you do not repent). I am she who does not keep festival (because I am beyond mere ritual and symbol), and I am she whose festivals are many (because it is my knowledge which has given you ritual and symbol). I, I am godless (beyond all form), and I am the one whose God is great (who is the Absolute Abstract Space, the Emptiness, the Void). I am the one whom you have reflected (meditated) upon, and you have scorned me (through the continued existence of your ego). I am unlearned (without intellectual definition or limitation), and they (everyone) learn from me (for I am Intelligence, Binah, the Divine Mother). I am the one that you have despised (because you love your ego instead), and you reflect (meditate) upon me (when you want to change). I am the one whom you have hidden from (when you try to absorb yourself in the vain pleasures of sensation), and you appear to me (because I see you always, even when you commit crimes against me). But whenever you hide yourselves (in your bed of pleasures), I myself will appear (to record your crimes and prepare your punishment). For whenever you appear (to realize your crimes and repent), I myself will hide from you (as punishment for rejecting me). Those who have [...] to it [...] senselessly [...]. Take me [... understanding] from grief. and take me to yourselves from understanding and grief. And take me to yourselves from places that are ugly and in ruin, and rob from those which are good even though in ugliness. Out of shame (for your ego and karma), take me to yourselves shamelessly (without hesitation or concern for the opinions of others); and out of shamelessness and shame, upbraid (strengthen) my members (all my aspects) in yourselves (through meditation). And come forward to me, you who know (Daath) me (initiates who work in Daath, Tantric Knowledge) and you who know my members (all my aspects, which you realize through meditation), and establish the great ones (Initiates) among the small first creatures (through your works in the first steps of Initiation, upon which you can rise to spiritual greatness). Come forward to childhood (Mastery), and do not despise it because it is small (without pride) and it is little (in material, worldly status). And do not turn away (spiritual) greatnesses (virtue) in some parts from the smallnesses (acts of service to humanity, done in humility), for the smallnesses (acts of humility) are known from the greatnesses (pure virtues). Why do you curse me (with one hand) and honor me (with the other, you hasnamussen)? You have wounded (me with your crimes) and you have had mercy (from me, nonetheless). Do not separate (distinguish) me from the first ones (of real Wisdom, Gnosis) whom you have known (in your first works of Daath, Tantric knowledge, for those who receive Initiation receive me and speak for me). [...] turn you away and [... know] him not. I know the first ones (who have achieved in-depth Realization) and those after them (their students come to) know me (through Daath, Tantric knowledge). But I am the mind of [...] and the rest of [...]. I am the knowledge (Daath) of my inquiry (into spiritual understanding), and the finding (of Wisdom) of those who seek after me (the Solar Logos), and the command (Kingship) of those who ask of me, and the power of the powers in my knowledge (Daath) of the angels (Self-realized masters), who have been sent at my word (Christ), and of Gods (Buddhas) in their seasons (manvantaras) by my counsel (wisdom), and of spirits (Chesed) of every man (Manas, Tiphereth) who exists with me, and of women (Geburah, the Divine Soul) who dwell within me. I am the one who is honored (through sanctity, chastity and service), and who is praised, and who is despised scornfully (by materialistic humanity, by fornicators, by the spiritual tyrants). I am peace (Samadhi), and war has come because of me (because the forces of the Light make war against the ego). And I am an alien (foreign to the Tower of Babel, the construction of materialistic humanity) and a citizen (of the conscious circle of humanity). I am the substance (which gives rise to all matter) and the one who has no substance (Prakriti, the womb of nature). Those who are without association with me are ignorant of me (that is, those who do not transmute the sexual force are not fecundated with my sacred fuel and remain in spiritual darkness; they lack DAATH), and those who are in my substance (Mercury) are the ones who know me (through Daath, Tantric knowledge). Those who are close to me (in my infernal aspect) have been ignorant of me (in my higher aspects), and those who are far away from me are the ones who have known me. On the day when I am close to you (as human), you are far away from me (as animal), and on the day when I am far away from you (as animal), I am close to you (as human). [I am ...] within (all things). [I am ...] (the essence) of (all) the natures. I am [...] (the energy which provides in Daath for) the creation of the spirits. (and) [...] request (for the creation) of the souls (in Yesod). I am control (in humans) and the uncontrollable (in animals). I am the union (Daath, religion, yoga) and the dissolution (of matter). I am the abiding (manifestation of creation; manvantara, day) and I am the dissolution (pralaya, night, respose). I am the one below (who rules even in Klipoth), and they come up to me (who is above all creation). I am the judgment (severity) and the acquittal (mercy; the two columns of the temple). I, I am sinless (without blemish), and the root of sin derives from me (because I am the force of creation, whether that is used to create in heaven or in hell). I am lust in (outward) appearance (because I am the raw power within all things), and interior self-control exists within me (I am the root of all virtue). I am the hearing (knowledge, Daath) which is attainable to everyone and the speech (verb, Christ) which cannot be grasped (by the mind). I am a mute who does not speak (the Void), and great is my multitude of words (the Verb which manifests in every bodhisattva). Hear me in gentleness (humility), and learn of me in roughness (willpower). I am she who cries out (because I love all creatures), and I am cast forth upon the face of the earth (to give life to all things). I prepare the bread (of Gnosis, which feeds the soul) and my mind within. I am the knowledge (Gnosis, Daath) of my (sacred) name (which is unknowable). I am the one who cries out (of love), and I listen (for the cries of my children). I appear and [...] walk in [...] seal of my [...]. I am [...] the defense [...]. I am the one who is called Truth and iniquity [...]. You honor me [...] and you whisper against me. You who are vanquished (trapped in the ego), judge them (who vanquish you) (those egos) before they (your many defects) give judgment against you (before the consciousness, the essence is completely trapped in the ego), because the judge and partiality (to crime) exist in you. If you are condemned by this one (the legion of egos within you), who will acquit you (of the results of your actions, your karma)? Or, if you are acquitted by him (the Christ, who is the only one who can save you), who will be able to detain you (for there in so greater power)? For what is inside of you is what is outside of you, (as above so below) and the one who fashions you on the outside (your body, made by the power of the Holy Spirit through sexual conception) is the one who shaped the inside of you (the soul, also formed by the sexual power of the Holy Spirit). And what you see outside of you, you see inside of you; (For man is the reflection of the universe) it is visible and it is your garment. Hear me, you hearers (you who have develop the Vishuddha Chakra through Initiation) and learn of my words, you who know me (through Daath, Tantric knowledge). I am the hearing that is attainable to everything (Akasa Tattva); I am the speech that cannot be grasped. I am the name of the sound and the sound of the name. I am the sign of the letter and the designation of the division. And [...] will not move the name. [...] to the one who created me. And I will speak his name. Look then at his words (those who have incarnated the Verb; that is the Bodhisattvas) and all the (sacred) writings which have been completed. Give heed then, you hearers (Initiates) and you also, the angels (Self-realized Masters) and those who have been sent (messengers of God), and you spirits (Chesed) who have arisen from the dead (who have resurrected in Christ). For I am the one who alone exists (I am nature, the Divine Mother), and I have no one who will judge me (for I am existence itself). For many are the pleasant forms which exist in numerous sins, and incontinencies, and disgraceful passions, and fleeting pleasures, which (sinful souls) embrace until they become sober (through the second death) and go up to their resting place. And they will find me there, and they will live, and they will not die again.